PLEASE NOTE: The Cuyahoga Valley National Park will be closing the Ohio & Erie Canal Towpath Trail within the CVNP this weekend for the Towpath Marathon. 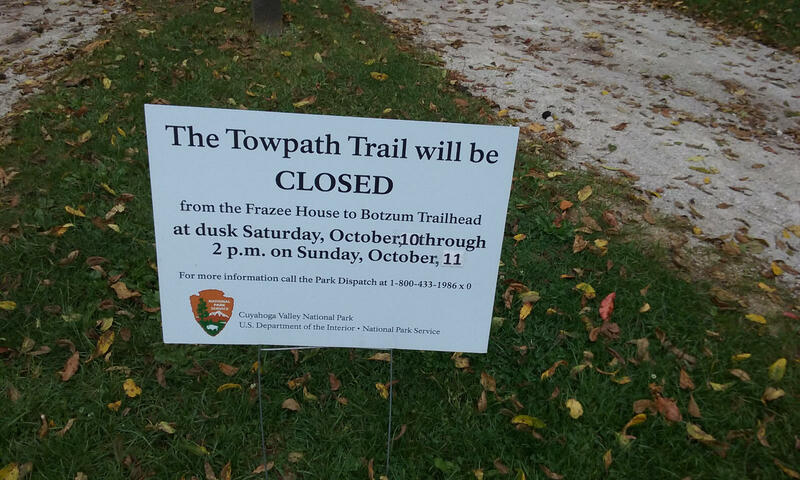 The closure affects the section of the Towpath Trail between Frazee House and the Botzum Trailhead. Parking lots and trailheads within the affected area will also be closed (including the Lock 29 Trailhead in Peninsula). The trail will be closed beginning at dusk on Saturday, October 10, 2015, and will re-open at 2:00pm on Sunday, October 11, 2015. Please note that this will affect our Towpath Trail Bicycle Rental in the Peninsula store on Sunday, October 11. We will resume renting bikes for the Towpath at 2:00pm or whenever the trail re-opens. Bikes must be returned before the 5:00pm store closing time, and we will not let any bikes leave after 3:30pm. For more information about the Towpath Trail closure, please contact the Park Dispatch at 1-800-433-1986 extension 0.